Labor’s Shelly Yechimovich has ‘interesting’ meeting with Netanyahu, but insists there is no chance her party will join the coalition. 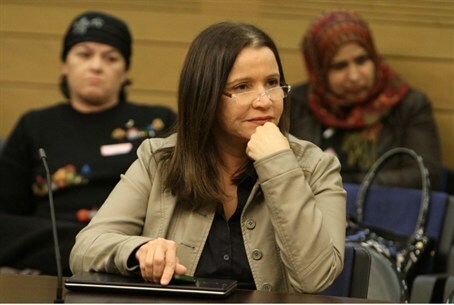 Labor party head MK Shelly Yechimovich met Tuesday night with Prime Minister Binyamin Netanyahu. The two spoke for over an hour. Netanyahu has been working to assemble as large a coalition as possible, and has met with representatives from several parties in hopes of convincing them to join him. While Yechimovich agreed to meet, and even termed the meeting “interesting,” she insisted afterward that there is no change her party will join the government. Yechimovich announced prior to the elections that she would not join a government led by Netanyahu. She reiterated her stance after the elections. Several senior Labor party members, including Binyamin (Fouad) Ben-Eliezer and Yitchak Herzog, have reportedly been pressuring Yechimovich to change her mind.